The clocks go forward, it’s Mother’s Day, and it’s also another comedy event in Kinghorn this Sunday afternoon, 31st March. With Stuart McPherson, Ross Leslie and guests, hosted by Shona Lawson, it promises to be a great opportunity to relax and have a laugh either with or without family members present! Tickets are just £5.00, available from the venue (which is above the Harbour View on Pettycur Road – phone: 01592 890577). We ran the comedy last night at a Curry and Comedy event for the Rotary Club of Buckhaven and Methil. The event was to raise funds for a defibrillator for Methilhill and they were pleased to announce at the end of the evening that the required funds had been raised, which was brilliant news. Well done to all of the acts who delivered the laughs: Graham Mackie, Jeannie Jones, Kenny Sinclair and Krystal Evans. The Glasgow Comedy Festival show 5 Fifers for a Fiver will be at The Iron Horse on West Nile Street this Wednesday, 20th March, from 19:45. We’re running the comedy section of a fundraising night for another local Rotary Club (Buckhaven & Methil) in Methilhill, Leven on Friday 22nd March. 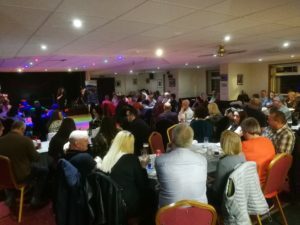 It’s a curry and comedy night and the line-up will be Graham Mackie, Jeannie Jones (compere), Kenny Sinclair, Krystal Evans and Richard Pulsford. Ticket enquiries should be directed to the Club. We have 3 shows in this year’s Glasgow Comedy Festival which starts later this month. 5 Fifers for a Fiver will be in the Festival for the 7th year in a row. This year it’s going to be at The Iron Horse on West Nile Street, on Wednesday 20th March, and it will be longer than the usual hour as 4 acts are performing longer sets. The night will be hosted by Scottish Comedian of the Year finalist 2018, Ross Leslie, and the full line-up is just being finalised – watch this space. But the ticket price remains a bargain £5! Richard Pulsford’s solo show for this festival is going to be at Mango on Sauchiehall Street this year, on Friday 15th March. Expect more of the usual wordplay and puns! And fresh from its debut success at the Leicester Comedy Festival last month, the new alternative history podcast show ‘It Just So Happened’ is going to be at The Iron Horse on Tuesday 26th March. The panellists for this show are going to be Vladimir McTavish, Matt Duwell, David Cruickshanks and Annie Gilfillan. Comedy returns to the Carousel café in Kinghorn on Sunday 24th February. Entertainment will be provided by Bill Dewar as headliner, Ruth Cockburn as compere, and Lubna Kerr and David Cruickshanks as supporting acts. The event costs £5 (tickets on the door) and will get underway at 15:30. We’ve had an article published about us in the Fife Free Press. It tells readers about our next gig (which is this Sunday afternoon in Kinghorn) and about Mirth of Forth Productions. We’re back for 2019, kicking off with our regular monthly Sunday afternoon event in Kinghorn, in the café above The Harbour View pub. Acts booked in for this event include John Gavin (one-time winner of Scottish Comedian of the Year) and Iain Hume (a finalist in the same competition in 2018), and the compere will be Carina MacLeod. The event starts at 15:30 and tickets are just £5.00, which can either be bought directly from the venue or on the door. A Happy New Year to all our followers. We look forward to providing more fun and exciting events in 2019. Already booked in are a further series of monthly Sunday afternoons at The Carousel in Kinghorn, Rotary Club events and appearances at The Glasgow Comedy Festival in March. We also hope to be running more festival events in Fife over the course of the summer. See you in 2019! We’ll be taking our showcase 5 Fifers for a Fiver show to the Glasgow Comedy Festival again in March 2019. It’ll be on Wednesday 20th March at The Iron Horse pub in West Nile Street. The line-up will be confirmed nearer the time.